Wavy Hair Pieces| Lori's Wig Site We Price Match! 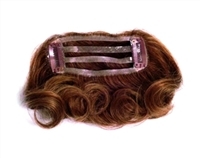 Wavy Hairpieces are made from either synthetic fibers or real human hair, they easily clip into your own hair to create that "new you look" you've always wanted only from Lori's Wigsite! This innovative collection of hairpieces provide you amazing extensions for your ponytail in just a pinch! Style BFM-280 is a beautifully layered, soft wave ponytail that flows passed the shoulders for a fun and youthful hairstyle. Clips onto your hair just as you would attach any other butterfly / claw clip. The honeycomb base allows room for your hair to hide underneath. Style 271 features a soft wave pattern for a beautiful and natural look. This style's graceful layers will fall just passed your shoulders giving you the long, gorgeous locks you want. Simply pull your own hair back into a pony tail and slide the wing combs into your hair on either side, hiding your pony tail inside the honeycomb pouch. A friendly, gently curled monofilament filler on a flexible 6½" x 6½" base with 4 pressure sensitive clips for easy attachment and a polyurethane front rim to accommodate tape for added security, Lyric gives a boost to a new coiffure or adds more hair where needed.